Additional research provided by Charles Battle. Stickball, a Native American game similar to lacrosse and called "anetsa" by the Cherokee Indians, was once played throughout the United States. The game was played by two teams with an equal number of men. The object was to get a tiny, walnut-sized, leather-covered ball through a goal using sticks shaped somewhat like small tennis rackets. The size of the field depended on the size of the teams and the availability of suitable terrain. The Cherokees were among the first to play consistently on a field about 100 yards in length, although some fields were much larger. There was no time limit; the first team to score 12 times won. Any strategy to score was acceptable, including biting, choking, and even banging each other on the head with the rackets. There were no time-outs or substitutions, but if a player was knocked out his opponent had to leave the game also. 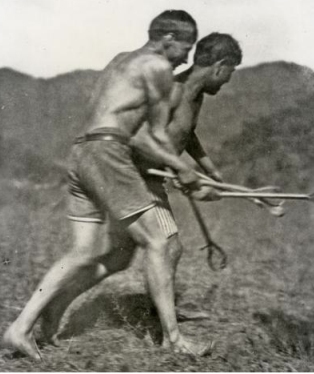 Although a less violent form of stickball is played primarily as entertainment today, the Cherokees once considered anetsa as the "little brother of war," an important training experience for future conflicts. As a precursor to such training, Cherokees sometimes participated in a pregame ritual in which players were scratched with a bone set in eagle feathers until they bled from 100 different wounds. There is evidence that the Cherokees once settled a land dispute with another tribe on the outcome of a stickball game. These contests, often surrounded by much ceremony, were the state's first large-scale spectator sporting events, attracting huge crowds, including local whites, during the nineteenth century. Many whites, in fact, adopted the game, which came to be played by Confederate soldiers and timber workers in the Mountain region of North Carolina. Stickball remains an important link between modern times and early Cherokee society. James Mooney, "Cherokee Ball Play," Journal of Cherokee Studies 7 (Spring 1982). Cherokee stickball. Image courtesy of the University of Pennsylvania Museum of Archaeology and Anthropology. Available from http://www.sas.upenn.edu/dpic/cherokeestickball/welcome (accessed September 12, 2012).